Countering Violent Extremism (CVE) is a Department of Homeland Security (DHS) counter-terrorism program that profiles Muslim, Black and Brown youth as inherently suspect and prone to radicalization. Disguised as a "community-led public health" alternative to heavy handed law enforcement initiatives, CVE endangers impacted communities in the very places they turn to for safety and healing: community spaces, mental health services and schools. CVE relies on community policing to locate individuals on the "path to radicalization" using indicators that criminalize the outward expression of Muslim, Black and Brown identity, political thought and religious practice. CVE is informed by a debunked theory without empirical evidence, which assumes there is a reliable way to identify "behavioral indicators" that can predict who may be on the path to radicalization. CVE focuses on Muslim communities, and the false premise that Muslims are more prone to radicalization than other religious or ethnic groups, particularly when White supremacists commit far more acts of extremism. CVE chills First Amendment protected activities (such as worship, activism, and expression of ideological beliefs) and further stigmatizes Muslim communities as inherently suspect with a dangerous intersection of mental health and law enforcement. CVE is a counter-terrorism program with a national security agenda. With these strings attached, CVE threatens the safety of our communities, all the while framing itself as a program dedicated to "building community resilience" by providing social services. Vigilant Love in partnership with Anti-CVE Coalition hosts a webinar on April 14th with Bilal Nasir on the history of how the mental health industry has been used as a tool for state surveillance. Vigilant Love in partnership with a statewide coalition of community-based and advocacy organizations is saying #NoPVEinCA! We are calling on Governor Newsom to reject any and all CVE and PVE programs in the state, and quickly dismantle those under his purview like the Cal OES PVE program. Cal OES, through funding from the U.S. Department of Homeland Security (“DHS”), is disbursing nearly $625,000 to groups around the state to leverage their relationships with Muslim, refugee, Black, and Latinx communities in a misguided attempt to subvert “violent extremism,” particularly among youth. Cal OES’s PVE program is modeled on federal Countering Violent Extremism (“CVE”) frameworks designed by agencies like DHS and the FBI. CVE and PVE are premised on the false and stereotype-laden assumption that Muslim, refugee, Black, and Latinx communities are inherently prone to “extremism,” “radicalization,” and violence. They are part and parcel of discriminatory surveillance, profiling, and mapping programs targeting marginalized communities throughout the country, fueled by Islamophobia, anti-Blackness, and xenophobia. Help us spread the word via social media about the organizational sign on letter! Please direct all questions to our partners at Asian Americans Advancing Justice Los Angeles, Hammad Alam halam@advancingjustice-la.org and Laboni Haq lhoq@advancingjustice-la.org. In 2014, Los Angeles became one of the first pilot cities for CVE. Since then, LA has been a pioneer in creating an "LA CVE Framework" amongst DHS, the FBI, US Attorneys Office, LAPD, L.A. County Sheriff, Mental Health and Social Services and hand- picked Muslim community groups. Civil Rights groups were never consulted. In 2015, the DHS Appropriations Act enabled the allocation of $10 million to expanding CVE efforts nationwide. Through this funding or separate DHS resources, the Los Angeles Mayor's Office began to launch local CVE efforts without transparency to community groups, limiting opportunities to resist. Through such resources, Los Angeles Muslim communities are now threatened with emerging programs such as LAPD's Recognizing Extremist Network Early Warnings ("RENEW") program with the intent to identify "early warnings of potential violent behavior" that involves "law enforcement tracking" and "mental health and wrap around services". In Jan 2017, civil rights groups began to place public and private pressure on groups who were awarded CVE funding, including the LA Mayor's office, the Muslim Public Affairs Council and the Bayan Claremont Islamic Graduate School. Since then, Bayan publicly declined funds, MPAC's grant was rescinded, and the Mayor's office, although it has now returned the funding, still supports the CVE theoretical framework. For an in-depth timeline of events regarding CVE in Los Angeles, visit this amazing page! MPower Change along with a coalition of organizations in Los Angeles drafted and circulated an anti-CVE petition resulting in over 1500 signatures. This petition was presented to LA City Council. 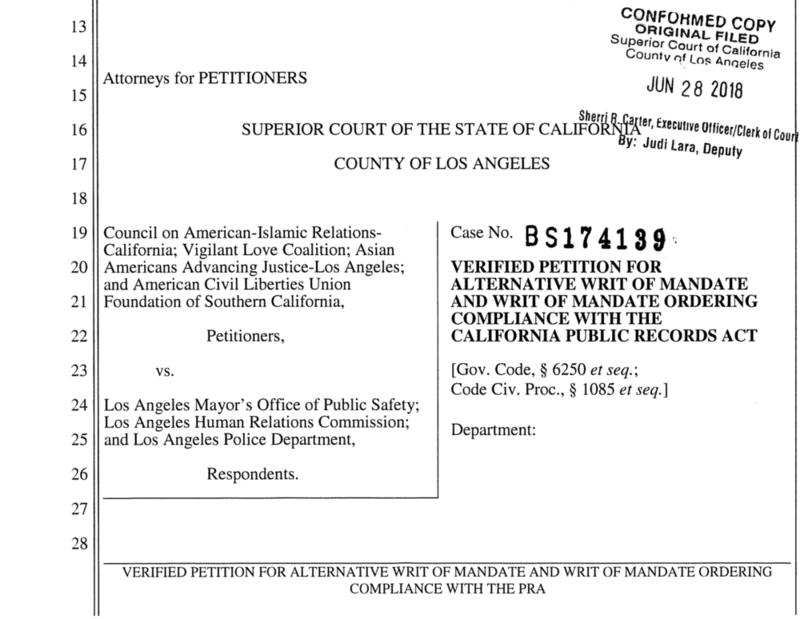 A coalition of organizations in Los Angeles filed a lawsuit against the City of Los Angeles for failing to respond to a Public Records Act Request regarding CVE. The Council on American Islamic Relations - Los Angeles in partnership with a coalition of organizations circulated an organizational sign on letter with a response of over 60+ orgs signing on. This letter was presented to LA City Council. 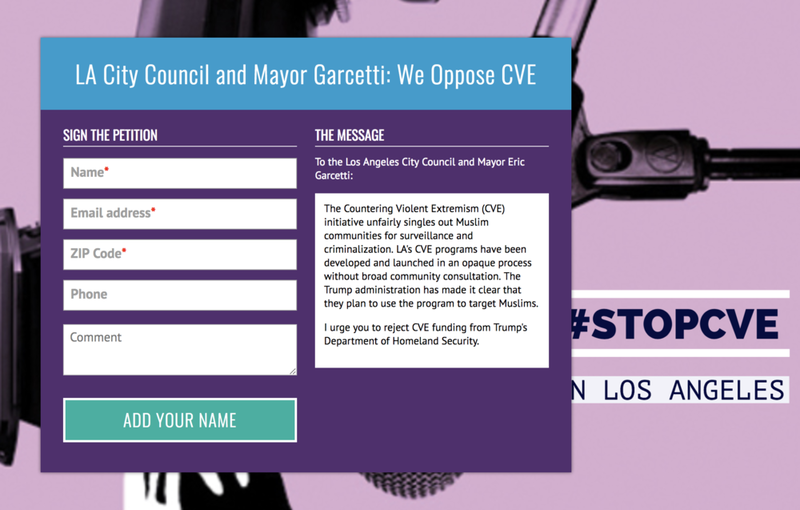 The United Teachers of Los Angeles representing 33,000 teachers in Los Angeles in coalition with Stop LAPD Spying Coalition, Palestinian Youth Movement, Black Students Union and Immigrant Youth Coalition released a letter firmly opposing CVE. Community members flooded city hall for months whenever the Mayor's CVE Grant was on the LA City Council agenda. Speakers were organized to represent a diversity of communities, professional disciplines and organizations. For more information about national CVE efforts, visit http://www.stopcve.com/. To get more involved in local #StopCVE efforts in Los Angeles, email us at info@vigilantlove.org and follow us on facebook!